Typhoon PARMA stayed around in the north of Luzon Island for as many as six days, and finally went away from Luzon into South China Sea in the afternoon of October 9. As concerned, however, heavy rains occurred while the typhoon had been staying, and more than 180 people were killed or missing due to landslides and so on. The control of a dam also raised an issue because the release of water from the dam caused flooding in the downstream. But this is because the forecast of this typhoon was extremely difficult, and so was the control of the dam. Typhoon PARMA made landfall at Luzon Island, Philippines, and moved across the island to reach Bashi Channel, but then the typhoon made a sharp turn toward Luzon Island to come back in four days near the point of making landfall in the northern Luzon. The typhoon is now expected to turn once again here to wander around the northern Luzon. This is a coincidence, but the first Typhoon PARMA, namely Typhoon 200318 is also known to show an unprecedented track making a very big loop in one week in the Pacific Ocean. 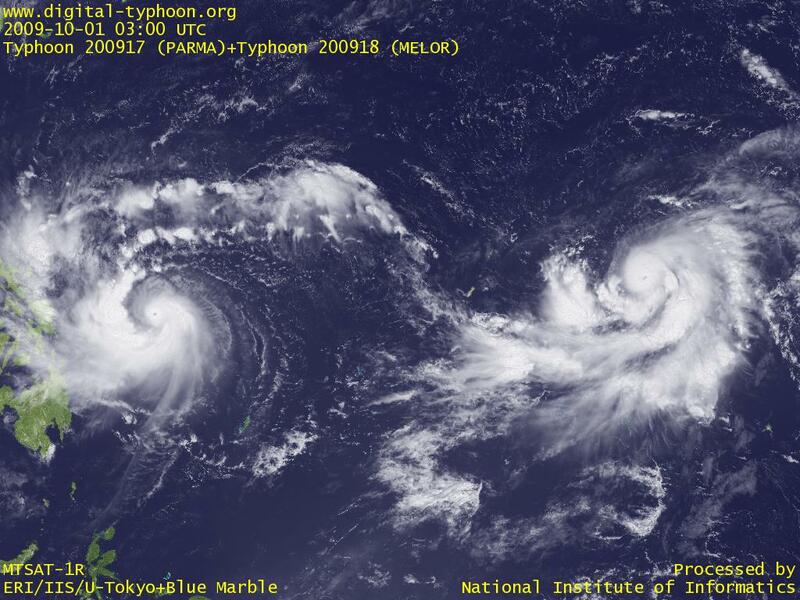 Complex tracks of Typhoon PARMA for two successive generations may indicate some kind of links between two typhoons. In addition, the complex track of this typhoon may be due to Fujiwara Effect between Typhoon MELOR. Typhoon PARMA has made landfall in the Province of Cagayan at the very north of Luzon Island. The track was far from areas affected by Typhoon KETSANA, and the winds were not strong, so people in the affected areas seem to be relieved. But it may be too early to be relieved. In fact, the forecast of the typhoon is changing to a speed-down around Luzon Strait after passing Philippines, and a slow and complex movement around there. As I have been writing, I think that this typhoon is more dangerous in terms of rains than in terms of winds. If this typhoon keeps the intensity and stays around here, the rainy clouds stay over the sky of Philippines for a long period of time, and they may cause heavy rains again to cause disasters, so please stay prepared. Typhoon PARMA is now moving west-north-westward in east of Philippines. The intensification was rapid, but the size of the typhoon was not so big, and this resulted in a relatively short period of peak intensity. On the other hand, thick clouds in the spiral band extending to the west are still very well developed, and they are starting to cover the land of Philippines. The weakening of the intensity of the typhoon is not an indicator of reassurance, and the track of the typhoon is getting closer to the land of Philippines, so heavy rains are still a big threat to Philippines, especially for affected areas by Typhoon KETSANA. Typhoon PARMA has intensified rapidly in east of Philippines where sea surface temperature is high. 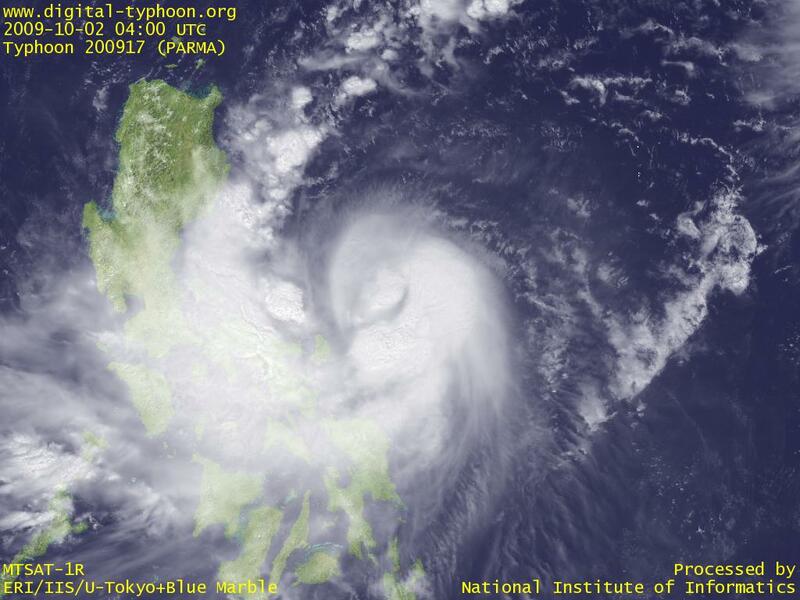 The image below shows that it has a very small eye in the center of small core clouds, which indicates that this typhoon has especially strong winds very near the center. In addition to strong winds, however, we may need to focus more on spiral bands that extend in the western side of the typhoon. This is because these clouds are well developed, and are extending toward Philippines. When these clouds reach over the land of Philippines, even if the typhoon does not make landfall, it will bring heavy rains once again, which will give a serious impact on areas in the recovery phase from Typhoon KETSANA. 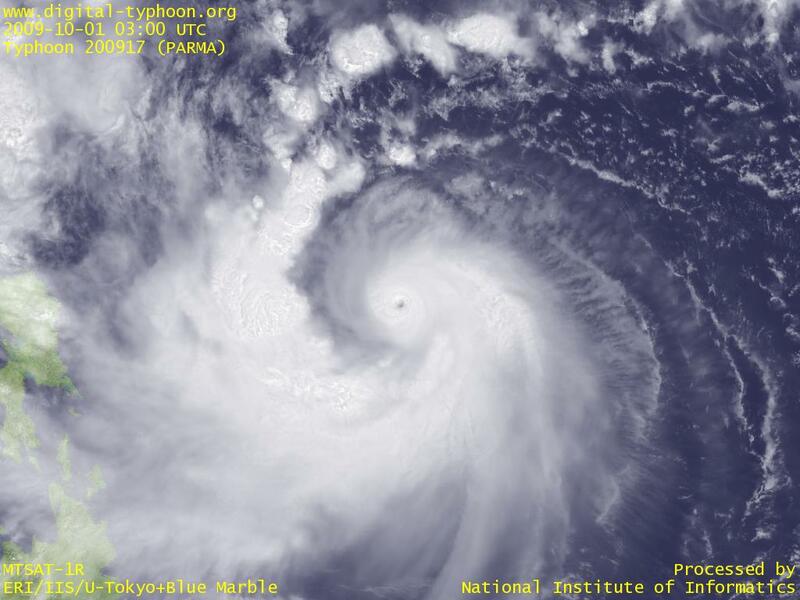 Typhoon PARMA was formed in Caroline Islands. This typhoon is forecast to draw near Yap Island and Palau, and move westward to northwestward.